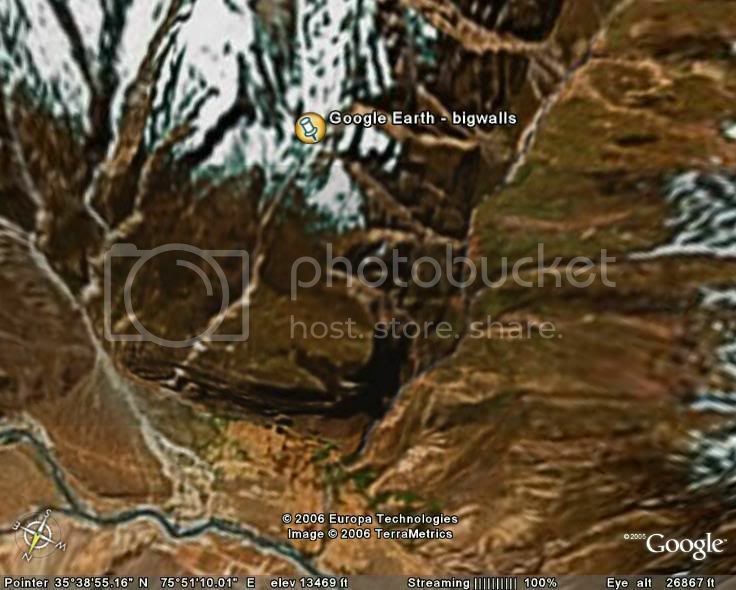 Free original A5 big wall hammer (lightly used) to the first person to post two Google Earth images (one from 5 miles up, showing the wall itself, and one from a 500 mile altitude showing the region with the wall location marked), which pinpoint the location of the unclimbed big wall pictured below. Limit three entires per person. No clues on this one, save for the wall is over 2000 feet and the fact that I took the photograph. I'm disqualifying myself just on the off chance that i get it right and then have an appearance of impropriety. we can't have that without at least a few beers, and I'm still at work (tho you'd think i have with my spelling errors- edited). Stumped.. Any other hints for us? Which direction does the face face? What time of day is it? What is the altitude at the top? Hey guys better get crackin' on this one. I am about to devote too much time that I don't have to get me that hammer. I have been trying to get one for quite a while and I am striking out big time. Another shot of the wall showing local vegetation and architecture. 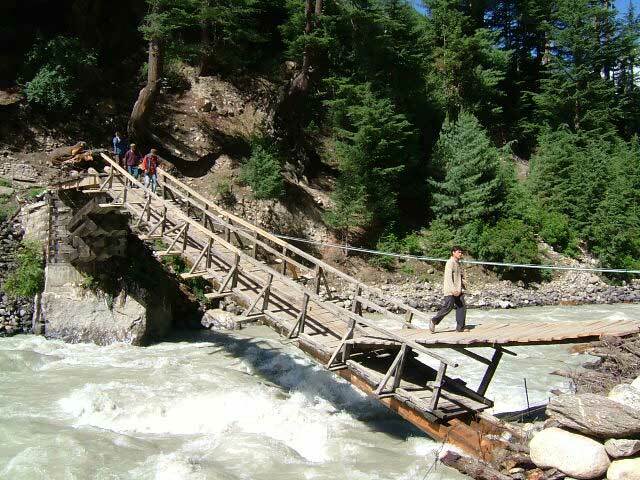 Locals crossing a bridge from the nearby village (you can see the wall from the village). 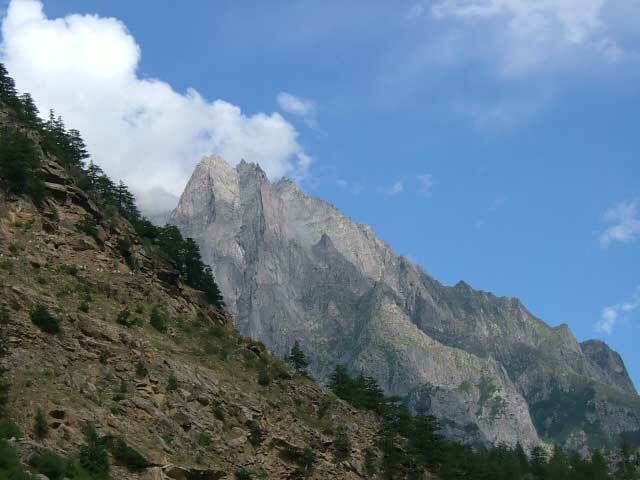 Another unclimbed wall in the same valley. Pete, great try. Lukewarm. Correct continent. I searched for this yesterday. The "your getting warm" hint tells me I may have been very close. However, I do not have Goofball Earth, and don't want to load it on my computer. John will you accept an entry from Goofball Maps? 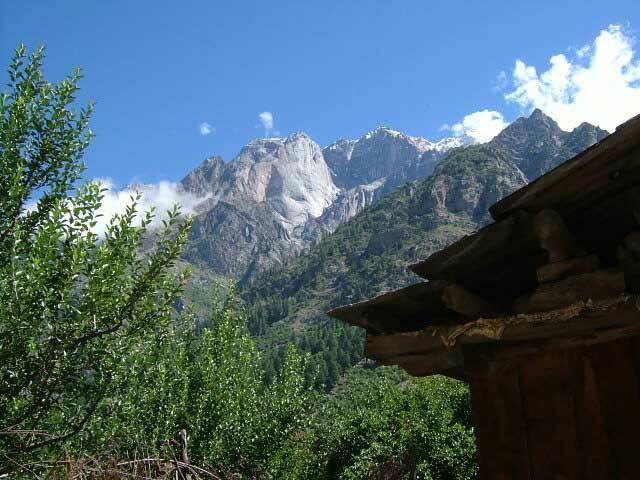 Did you know that India contains 20% of the worlds granite? I didn't till yesterday. 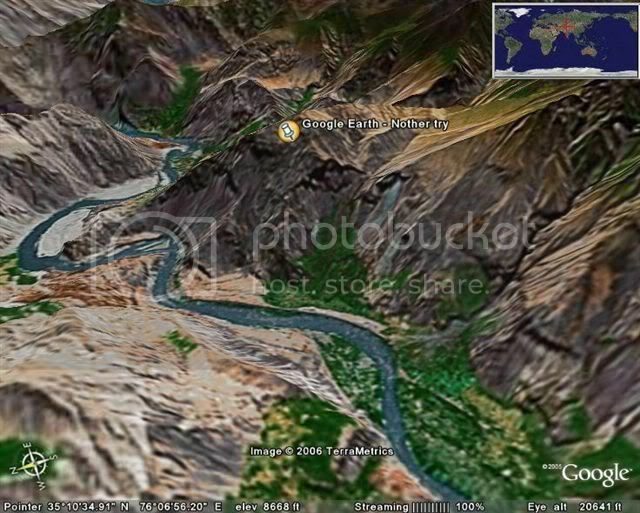 The trouble with Google Maps is it doesn't have the lat/long coordinates, which I will need to verify the location. But if you can figure a way to give me those, a Google Map might be ok.
nope. Good try, looks like an interesting area. You were within 5 degrees of both latitude and longitude. Another effort! This is really tricky! I wish I was planning a trip there right now instead of poor and wet! Damn Britain! Oh my..... spent a lot of time with this. 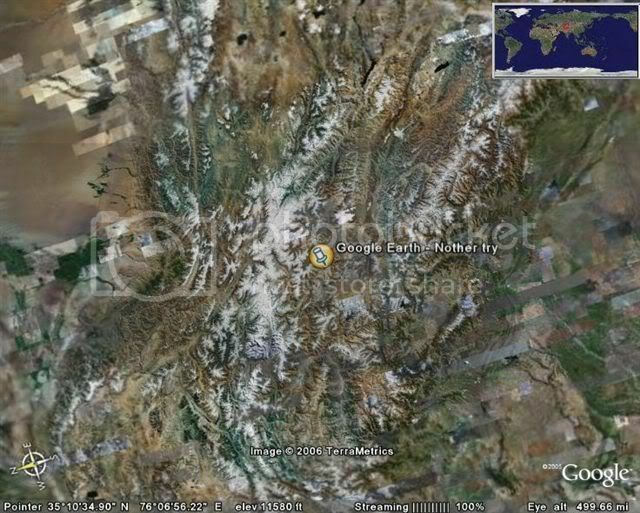 The google earth is pretty fun, now that I loaded it. Great geography lesson, However. I should post an image of the 5000ft monster I found. Anyway, here is my best shot, based on all the little clues I could derive from your pics and previous posts. Actually, I don't believe this is correct. It's the pic of the river that throws me off. It appears to run somewhat oriented toward North. no, but it looks nice. Hey, is it too late to play? The thread is damn near a year old but I never saw it solved so I'd like to take a crack. I just figured out a very large piece of this puzzle, but I'm not inclined to put all the neccessary pieces together (upgrading RAM etc.) to put my own entry in here. So, my question: May I put out a generalized hint or two? Zippyslug- Close, but no cigar. It is to the East of where you spotted. Caribouman-By all means, hint away. The hammer I have is just itching to be used again on the big stones! I thought I'd join in on this thing. 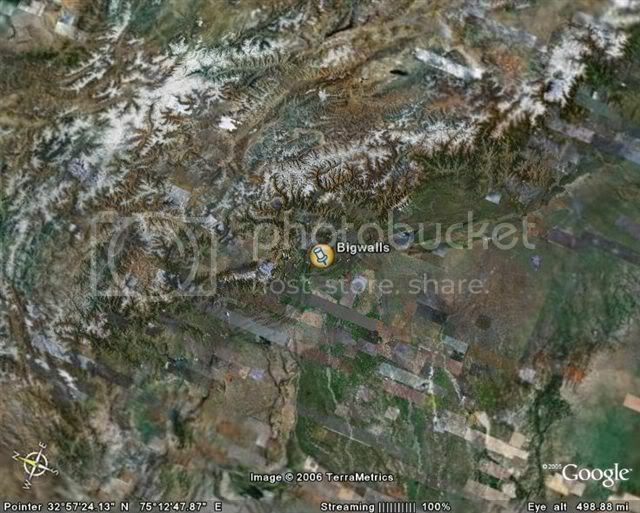 I've been having a grand time looking around this region, first time really using Google Earth. It's a great tool!
" 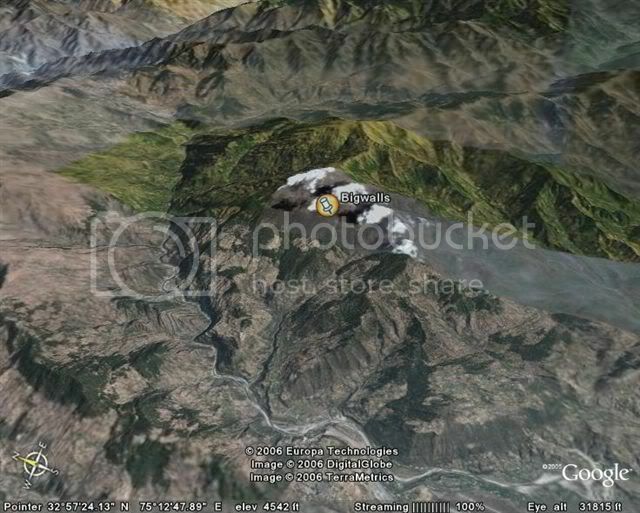 first time really using Google Earth. It's a great tool! " spritchard- Nope, not the right region. I've never been in that area, but it looks like it would be spectacular! I did once hike around Mt. 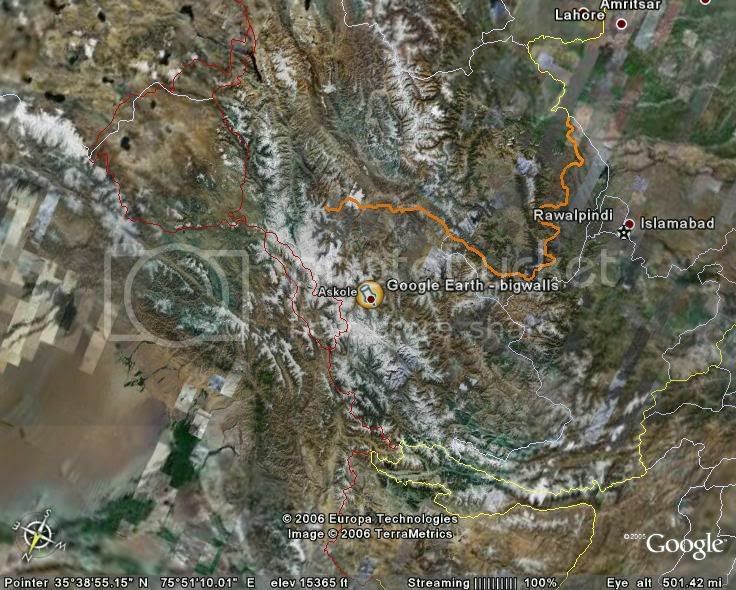 Kailas in Tibet, but it's not around there either. - the wall is in the Karakoram, the western part of the Himalaya, no? - Look at how close that wall appears to be, and the angle to which the camera is tilted... low angle. Thus I'd say we're looking at a minor peak, not 7 or 8 thousand meters. Maybe 6, 6 and a half. - Look at the tree line. The tree line alititude is different in different places, probably pretty high at that latitude, but not below the 9,600 of the Sierra Nevada. That might give a rough clue to the overall peak height. - Also, I might go out on a bit more of a limb and say that the photo was taken mid day... something about the foreground shadows maybe. So that would narrow the face direction to South. - Big stretch. The rock itself; the overall shapes and color look either Karakoram or Patagonia, and given other respones, t'aint Patagonia. So Deuce, any of those ideas correct? whatever happened to the new hammer thread on the Taco? Was there ever any feedback on IceRavines answer? That one looks pretty promising. Sometimes I succeed. Sometimes I fail. Sometimes I am too lazy to do either.